A lot has been made of Luca Turin's statement, as quoted by Chandler Burr in The Emperor of Scent, that Caron Tabac Blond is "dykey and angular and dark and totally unpresentable", and that a man who takes a woman wearing Tabac Blond to meet his mother is set for trouble. For sure, if the mother is looking for a gently floral daughter-in-law with a cashmere sweater set and a subscription to Good Housekeeping, she will be disappointed. But Turin's larger discussion is often overlooked, that Tabac Blond embodies the wit and intelligence of chic. Turin ends his rant about the sorry state of chic these days by saying that a savvy mother will admire the style of her son's Tabac Blond-wearing lover. Ernest Daltroff created Tabac Blond to complement French women who, after World War I, picked up American women's acceptance of smoking in public. It was released in 1919, the same year as Guerlain Mitsouko. Both Tabac Blond and Mitsouko are icons, but while Mitsouko stands revered and beautiful but not always very approachable, Tabac Blond is as easy to wear as a perfectly-cut trench coat. The first time I smelled Tabac Blond was on a cotton ball, and it seemed harsh and almost diesel-like to me. Once I had it on my skin, though, I knew I’d always have a bottle on hand. The Caron website lists Tabac Blond as "a great emotional perfume" and goes on to describe it as "mild and powerful, coppery overtones combined with a floral heart note…troubling sensuality of a woman in a dinner jacket. A touch of masculine nonchalance." Although I can imagine a man wearing Tabac Blond well, on me the perfume feels luxuriously womanly. It’s top notes are leather, carnation, and linden, with heart notes of iris, vetiver, ylang ylang, and lime-tree leaf. Its base is cedar, patchouli, vanilla, amber, and musk, although a smoky, spicy vanilla is mostly what lingers on my skin. Tabac Blond's range isn’t huge. I don't get the piquant top notes that many fragrances provide, but instead tobacco leaf, gently supported by spicy florals, starts right off the bat. Then the scent of raw leather appears for a while, and the effect is that of a buttery leather ashtray full of cigarette butts and snickerdoodles, or maybe a leather-vanilla soufflé in a smoky brasserie, if anything like that were ever cooked up. Imagine lipstick-stained wine glasses on marble-topped tables, a smeared golden haze on the mirror over the bar, and worn, red leather banquettes, and you start to get the idea. Tabac Blond has good staying power, and a dab on each wrist and behind the ears will last all day. Lauren Stover's The Bombshell Manual of Style says "if you must travel light and Tabac Blond suits you, this is the perfume to grab", and I couldn’t agree more. Chic, like students, artists, and clergymen, can go just about anywhere, and on the right woman Tabac Blond is chic as all get-out. If you talk to strangers, would choose a mutt over a purebred dog, drink brown liquor, and prefer stick shift, Tabac Blond might be your Holy Grail. I've heard that Tabac Blond can be had in Eau de Toilette and Eau de Parfum, but I’ve only tried it in parfum, and reports are that it's the best form. 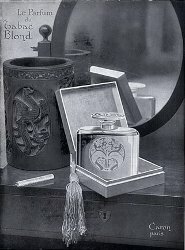 Tabac Blond is one of Caron's urn fragrances. For buying information, see the listing for Caron under Perfume Houses. I don't think TB is “dykey” or angular; it is sultry and well-rounded, without being overly feminine. …and, as you said, it is chic as all get out. Hi Angela – spot on review. I heard from the SA at Bergdorf Goodman that this was Caron's best seller there. It's my favorite (love mutts and driving stick shift too), but I would have thought their best seller would be something more approachable like Parfum Sacre or Montagne. Then again, most people who seek out Caron probably aren't looking for approachable. I agree 100%! That's why it's so womanly to me–not girlish or even feminine, but womanly. I would have thought Sacre would have been the winner, too. Or maybe Bellodgia, or even En Avion. Well, I guess there are lots of us out there with good taste (and more of us with mutts–my spotted mutt, Tex, is snoozing in the next room). I love tabac blond, and even though my pooch isn't a mutt, he might as well be, and I've only ever driven a stick shift from the first time I bought my own car. It is chic, but very approachable. My first perfume to “awaken my senses”. I bought a tiny bottle at the Caron salon in Melbourne during the 80's. This was a gift for my partner and I'd never smelt anything so chic, so foreign, so mysterious. ” would you like to watch the perfume being decanted”. The sales girls statement still lingers in my mind. I will never forget this experience. I love how perfume can be so emblematic of luxury and chic (and here of love for a partner). I've never see an urn fragrance being decanted, but I plan on it some day! Aw, what a coincidence, I'm wearing Tabac Blond parfum today. I lvoe this stuff, though the first five minutes or so are a little dicey while it settles in. After that, it's all good. But then I drink brown liquor and prefer a stick shift. Oh, and “a leather-vanilla soufflé in a smoky brasserie”? Priceless. It may take me a few minutes to get the coffee off of the laptop, though. Ah, the vintage was dykier. They made it friendlier. Darn it. I'll add it to my list of “find in vintage”. Why don't they quit messing with the classics? I thought Caron might be a little better about that. Hmm. What would be the scent mimicking coffee and computer? Maybe it hasn't been made yet, but it sure has potential. Haha…honestly, “Armani Code” sort of reminds me of computers and coffee ;). Thanks for the great post! The “code” part of the name sounds appropriately computer-ish! I just received a decant of Tabac Blonde from a seller on another blog. Mirabile dictu! This is the same mysterious scent I have been cherishing (only whiffs are left now) in small perfume bottle from a boutique in Indianapolis. I was there for a teacher conference in the 1980's, and came upon a lovely perfume boutique downtown. The owner decanted two Caron scents for me–this one, and a Christmas scent that must have been Nuit de Noel, but I fuzzily think I remember her declaring that this holiday scent was not the usual and therefore may not have been Nuit. Was there another holiday perfume besides Nuit de Noel? Anyway, thanks to you, I now understand the concept of urn perfumes. I could never figure out what was going on there in that shop. This is exactly what she had, and this was a bona fide high end perfume boutique, and not one of the discount houses one finds in stand alone perfumeries now. I am sure the place must be long gone. I am so thrilled to realize that the mystery scent is Tabac Blonde. I'm so glad you found Tabac Blond, but I have to say that I'm pretty surprised to hear that there was a perfume store with Caron urns in Indianapolis. Some perfume stores, though, have bottles of the urn scents that they sell already decanted (decanted at the Caron mother store and shipped to them, I guess). It's marvelous how scent brings with it a whole raft of memories, even if it's a scent from a long time ago. Nocturnes is said to be a modern interpretation of Nuit de Noel, and I wonder if this is the scent you remember? I love Nuit de Noel and wear it from Labor Day to Memorial Day, and all the holidays in between. Thank you for the wonderful review! This is one of my very favorite scents (and Mitsouko is another). You capture it beautifully. Thank you so much! I'm glad you enjoyed the review. Brilliant review! Was pondering what my afternoon scent should be today, so the timing of reading this was perfect and am now happily inhaling TB. Sadly, although I love mutts, I don't drive a stick shift (I assure you, you wouldn't want to be on the road w/ me driving one), drink brown liquor (may start) and only occasionally speak to strangers. However, I'm hardly the gently floral type w/ a subscription to Good Housekeeping and my excessively sensible MIL views me as tragically eccentric and inappropriate for her precious son. I think she would label me as a TB type and not in the least mean it in a complimentary fashion. And I would happily accept the label. My father bought “Tabac Blond” for my mother when they first met. No confusion there. Dykey – since when does a perfume fonder gender preference? Is there a p.c. list of what is and an't? I can just see these little bottles laughing and lurking. I guess Mr. Turin would havve gone mad at Versailles in the day. Tabac Blond is pretty terrific, no matter what gender or person of what sexual persuasion wears it, that's for sure. I've got the same MIL issue, and Tabac Blond sounds great to me. As Habanita is my current fave, I've got to try this! Yes, do try it and let me know how you like it. My mother only wares one perfume and is very difficult to please. I forced her to try this, and she liked it. Big, big break through. This is so classic and wearable. And it lasts for ages on the skin. No need to re-apply during the day, I find. Your descriptions of marble topped tables and leather banquettes remind me of an evening in La Palette in Paris, waring Tabac Blond! Perrrrrfect. I would have thought Tabac Blond would please someone more experienced with perfume, but it sounds like your mother was holding out for the best! You're right! The only perfume she wears is Mitsouku! So she has good taste. If you can recommend any others she might like, I'll give them a go. You've been to La Palette?! We were there for my cousin's birthday, and dined on bread and cheese and cold red wine. It was perfect. St Germain is very classy, and Tabac Blond was the perfect accompaniment. I just got back from a cool New Year's Eve Party in London, where the theme was 1920's Berlin, and I, of course, wore Tabac Blond. It's just about of that era! Happy New Year to all Now Smell This Perfumistas! Well, you've already had your New Year, and mine is still six and a half hours away! I went to La Palette a few times when I was in grad school and spent a term at L'Ecole Nationale d'Administration. It really does feel like the classic Parisian cafe–cranky waiters and all. I really like Cuir Mauresque, too, and I will cry giant tears when my decant runs out. I don't see Cuir Mauresque as a substitute for Tabac Blond, though, because of its smoothness and funky opening. But then again, Tabac Blond these days is reported to be a neutered version of what it once was. Vintage Tabac Blond would be fabulous. Without it, maybe Cuir Mauresque is a better choice….what a tough decision! OK – there's only one way for me to proceed. I ordered a sample of TB in Parfum, to try it in all its re-formulated glory! I really do want to compare it to the EdP. I know how different Jicky/L'Heure Bleue are in P/Edp/EdT. I hear you re: Cuir Mauresque. Sadly, my sample has dried-up too – it may be worth investing in a larger sampler from Perfumed Court, since I couldn't possibly afford the bell jar right now. I recently started seriously investing in sample testing, and I find it's the best way to discover if I LOVE a perfume enough to purchase a full bottle. Since I've been sampling, there's been one or two that I REALLY miss when they run dry. And they are not the ones I expected to! eg: Muscs Koublai Kahn and Cuir Mauresque. But, so far I own Ormonde Woman, Tabac Blond and Incense: Kyoto – so I can see a theme emerging when I add MKK and Cuir Mauresque to that list……. Great choices! You're definitely tending toward the sultry and skanky, and there's not a thing wrong with that.